Another 'Greek' vacation came to its end, after we chose to take, and risk a little, probably the longest drive toward the ancient civilization cradle in history of all of our summer vacations. Driving in a row full 14 hours is not exactly fun as expected but in the end when I put all the 'pros' and 'cons' after couple of years of planning and anticipating our first visit to the famous Peloponnese, it was worth the wait. But before a story about sites we visited I'd like to share some thoughts about the journey itself. This year it was the weakest link of our entire vacation and little 'pros' can be take out of it. First of all, it was too long and with 40+ degrees Celsius outside, it was far from being pleasurable and relaxing. If you add to the 'cons' list too many moments with driving poor roads and unnecessary waiting time on borders and tolls, especially within the transiting country of Macedonia (FYROM), I am not far from the decision that next time we will be choosing different route for the travel to Greece and most likely book the plane instead or for smaller trips to check out the new highway European Union is currently building in Bulgaria. Fortunately, all the 'cons' ended with journey alone and all the good mood and perfect vacation spirit recovered fast as soon as all the 'pros' overcame in days of one full week of our second vacation south from Greek Macedonia and our first visit of Greek capital, its municipality area, the Corinth canal and ancient Peloponnese. Perhaps the most exciting time we spent during first couple of days was with filming remaining scenes for our short film "Game of Life" (embedded below), we were playing with all summer long. It all started pretty benign and just like another father-son playtime but somehow it evolved into real project with decent storyline, filming scenes on four major locations and also using chroma keying technology with green background for dialogues. With last scene taken in Greece we now have 90+ video files in total. Anyhow, this was one of our best play so far and we both enjoyed very much with all the bloopers and improvisation. 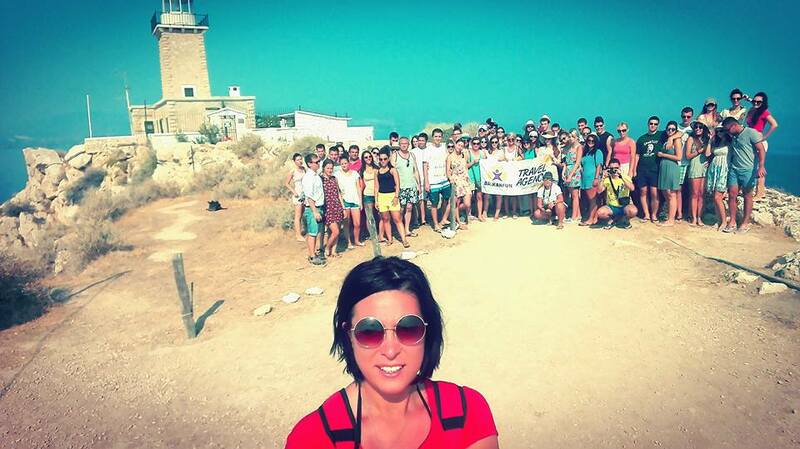 The most importantly, this film, would not be possible without a lighthouse as it plays major role in the story and we found it just 20 kilometers from our hotel with tremendous view to the entire Corinthian gulf. We spent three days on the site and nearby beach and finished all the 'Greek' scenes. 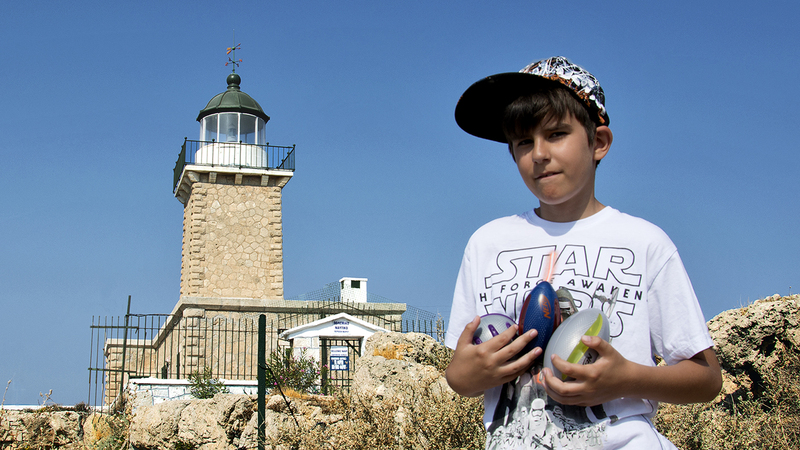 In above photo, Viktor, with our 'nerf' portal stone preps, is posing in front of 'Faros Melagavi' built on the rock near to the 'Vouliagmenis' lake where we filmed last portal scene and also just next to ancient archaeological site of 'Heraion of Perachora' - a sanctuary occupied by real oracle, just like the one in Delphi, dedicated to the goddess Hera and built in 9th century BC. Here, just next to the old ruins of the temple of Hera I found a stone perfect for a green screen scene we already filmed in our living room 'studio' and more or less successfully merged it into film's main dialog. In a way, we were, sort of, pioneers in exploring Corinthian vacations from Serbia. This was actually only second year for travel agency "Balkan Fun" to organize stay in Loutraki - seaside resort located in the gulf of Corinth and just couple of kilometers from the western exit of Corinth canal. It is actually a thermal spa center known from ancient times with natural water springs with multiple healing abilities. If you bought bottle water in Greece anytime in the past, the chances are that some of them are from Loutraki spa. We staid in hotel 'Mon Repos', very nice old hotel with genuine 'Otis' elevator from the middle of previous century. If you watched 'Kate and Leopold' you probably know what I mean. The town is not perfect for families per se - the beach is not sandy and wide with deep water comes very soon from the rocky part but if you are in your twenties - with famous hotel Casino and numerous night clubs you are in the right place. If you are older and with small kids don't forget to come here with the car so you can be able, like we did, to explore the neighborhood. Anyways, we chose to come here with 'Balkan Fun', not only because they were the only agency offering Loutraki for the fair prices, but also because of their numerous bus excursions to the Athens and Peloponnese. Anja Bačanin, our travel guide did perfect job with organizing the tour and with her 'radio host' voice in decent buses, perfectly provided all the information needed. I admired her for her ability to tell a story with thousands of years of ancient times perfectly wrapped into just five or ten minutes. Not all travel guides can do that and with these words this is our thanks for all her efforts during our stay and especially for two excursions we shared with the group. And from two excursions in the Greece mainland one was visit of ancient Acropolis of Athens which was one unforgettable day. Especially for me as this was my second visit of the site with first one being when I was younger than my son today. I still have scanned image of me doing 'number one' emergency in the Acropolis some 40+ years ago and all my efforts to find the same amphora where I did it failed, probably due to the fact that new museum opened in the foothill of the site since then and all small artifacts are probably moved there. Still couple of 'déjà vu' memories triggered in my mind especially at the gate. Too many years passed I guess - I was perhaps 3 or 4 years old and it is not easy to remember things from that distance in time. I am still happy I experienced couple of flashes of familiarities and resemblances. Second excursion was named 'Discovering Peloponnese' and it justified its name widely. To be honest, quietly I was all in for this vacation this year, just because of this trip and especially for a chance to visit Mycenae fortress. Within the second millennium of BC, Mycenae was one of the major and the only center of Greek civilization and if you ask me, all the ancient Greek times later, including 'Classical Greece' that flourished in couple of hundreds of years started somewhere in 5th century BC have to thank their origin in Mycenae. It was populated all the way from Neolithic times, ever since probably the last ice age, but the most prosperous times was around 1350 year BC, at its peak when the entire site was built in a famous Cyclopean masonry - with massive limestone boulders and no use of mortar of any kind. In Greek mythology Cyclops, the one-eye giants, supposedly lived before last ice age and in ancient times, were the only ones capable of lifting stones and some of them we saw on site were larger than two meters in high and probably weigh tons. Well, if you ask me, the Cyclop builders in this and any other cases, were probably elephants, strong horses and "expendable" slaves, but still, ingenuity of the old masons never disappoints. Their ingenuousness and beautiful museum with alien-like artifacts is something I will remember for a long time. The peak of the Mycenae dated just couple of centuries after the devastating volcanic eruption of Thera or well known Minoan eruption of the island today known as Santorini. I wrote more about it in posts Aegean Sea and Atlanteans, but in the nutshell there is a theory that survivors of old Minoan civilization (Atlanteans?) or at least some of their ancestors, after the eruption came here and founded Mycenae in the first place or mixed with natives. Artifacts found that resembles Minoan deities are one of the evidences that it might be true along with similarities in written language used. 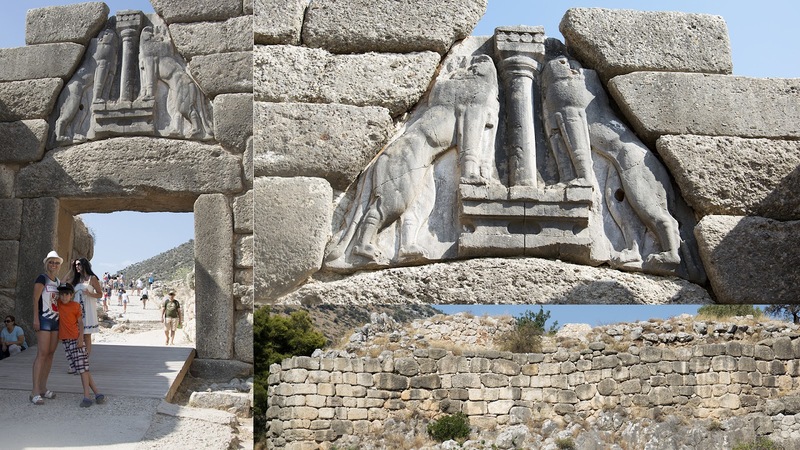 That's the history and scientific hypotheses but as far as mythology says, Mycenae is founded by legendary Perseus, a demigod, the son of the ultimate god Zeus and mortal woman Danaë, daughter of King Acrisius of Argos. If you didn't see "Clash of the Titans" and "Wrath of the Titans" with Perseus played by Sam Worthington, go ahead and 'rent' them - they were not that bad movies at all, despite all my reservations and best of all the script of the second movie offers the answer to the ultimate question of how and why gods from Olympus ended their presence on Earth. Of course, the excursion was not only about ancient of the ancient Greeks - we were privileged to visit Corinth canal itself, the legendary sanctuary of Epidaurus with amazing amphitheater, probably bigger than the one in ancient Hierapolis of Pamukkale in nowadays Turkey and most of all the old capital city of Greece - Nafplio, amazing city with colorful history that one time in middle ages was ruled by Republic of Venice. It was the capital of the First Hellenic Republic and of the Kingdom of Greece in early 19th century and its mixed architecture is still visible today. 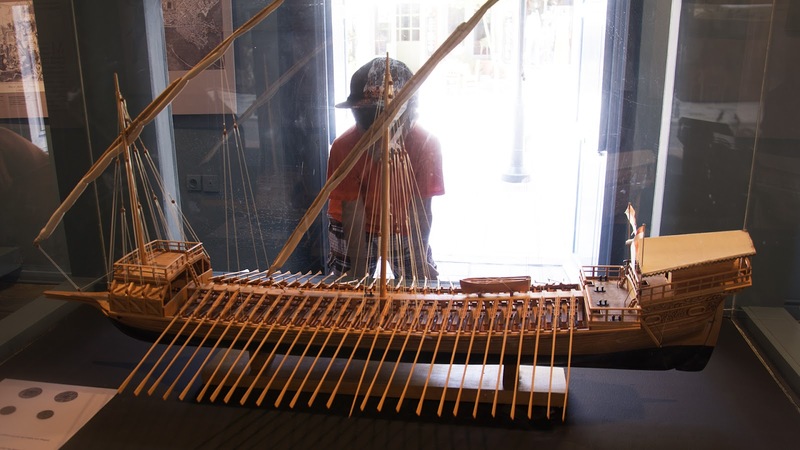 Viktor and I visited their small and wonderful war museum that is hosting many items and stories about last millennium including a model of the Venetian war ship from the time. Sometimes I wonder if one lifetime is enough to visit entire Greece and its ancient and modern sites and cities. Probably not. One thing is for sure. More summers waiting ahead. Anyway, this vacation gave us lots of knowledge and experience and I am sure with this year there are less and less sites still waiting to be explored and seen. Aside from couple of Aegean islands still in my to-do list, regarding Peloponnese I still have couple of regrets especially if I think of Sparta and ancient Olympia. Speaking of Sparta, what we didn't miss and stopped to see during our journey, was the "ΜΟΛΩΝ ΛΑΒΕ" monument, next to the highway and old site where famous battle of Thermopylae happened. 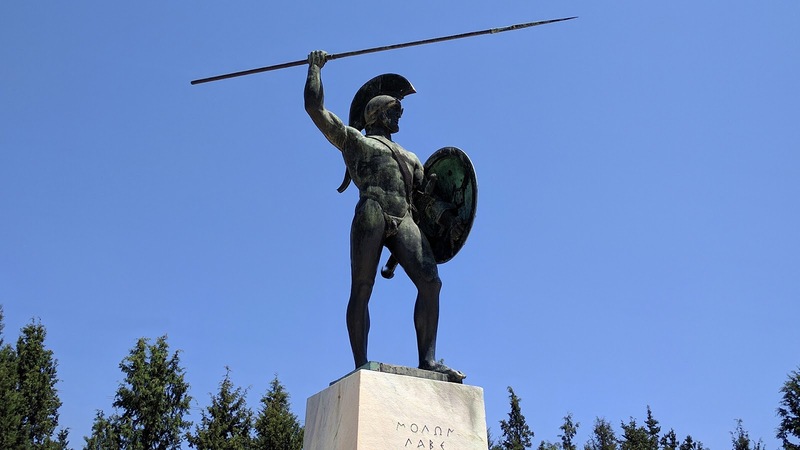 Leonidas I, as I wrote in posts Fishermen and Pirates of Evia and Warfare Then and Now, lead small army to defend Greece from Persian invasion in august 480 BC. He failed to defend Greece from Xerxes' large army at Thermopylae but even today, after 2500 years, his bravery will be remembered as the greatest last stand battle ever recorded. Not to mention the movie and famous line "This is Sparta" which is not only artistically perfect but also not too far distant from the facts as well. I rarely publish on the blog personal photos that are not ours, especially not selfies, but this post deserves an exception. Following image is made by Anja, our guide. Great colors and style. Well made. I mean it. We are somewhere in the picture and not just us - behind the group to the left is my backpack I accidentally forgot to bring with me and coincidentally where it stands, is the exact spot where the first image from this post was taken. As for the rest of images in the post, this time I chose to include only selected photos that are following the story but there are more and all of them are in the album named, well, you probably guessed Cyclops of Peloponnese. Needless to say is that I recommend the entire destination, travel agency and all the excursions.